With commercially made stone veneer, also known as cultured stone, going for $4-$8 a square foot I decided to make my own for a retaining wall. I will admit it was time consuming but if you know you have a project that requires stone veneer in the summer with patience you can make quite a lot over a period of time. The first step is to buy molds for your style mold. 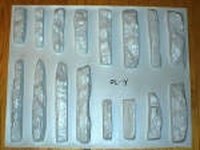 You can find these molds on ebay, and on google searches looking for DIY stone molds. You don't have to spend a prohibitive amount, I spent seventy dollars for plastic molds that suited nicely the project at hand. Once you have decided on what molds to use, spray the inside with some type of non stick spray very lightly so the stones won't stick then mix your cement in whatever mixing container of your choice, I used a small plastic mortar pan. Guess the amount you'll use for the amount of molds owned and try to match that amount. The other thing to consider is adding pearlite to the mix as this will lighten the stones considerably making installation easier. I usually used one part pearlite to one part sand as a good compromise between strength and weight. As you mix the cement choose what color your going to make the stones. It's best to add some pigment directly to the wet cement mix until you get a color you like and to really up the realism apply some of the pigment to the inside of the mold with a paint brush preferably a slightly different color as a highlight or something totally different for a contrasting look. Experiment on the process with a couple batches until you get a look that is satisfactory. Just remember to let stones dry for a couple days to get their final finished look.